Downplaying allegations of glaring discrepancies, the Delhi University on Tuesday said Prime Minister Narendra Modi's BA degree as circulated by the Bharatiya Janata Party is "authentic" and it has all the relevant records relating to his graduation while terming as "minor error" mention of 1979 in his degree when he passed out a year earlier. The clarification by DelhiUniversity's registrar Tarun Das came amid the raging controversy over Modi's educational qualifications with the Aam Aadmi Party continuing to question genuiness of the BA degree. "We have checked our records and it has been authenticated that Modi's degree is authentic. He cleared the examination in 1978 and was awarded the degree in 1979," he said hours after an AAP delegation went to the university seeking details of the degree. Asked about certain discrepancies being alleged by the AAP in his marksheets and degree certificate, he said, "the discrepancies in names in two marksheets exist in university records as well." "The university seeks to maintain privacy of any student who is getting enrolled with it. In view of the queries and reports in media, we would like to state that Narendra Damodardas Modi had qualified for degree of Bachelors in Arts. His enrollment number was CC 594/74 and his examination roll number number was 16594," Das said. Asked about variations in Modi's names in marksheets, Das said it is a common error as far as middle names are concerned. "Similar errors are often pointed out by other students as well which are rectified when requested." On being asked about the AAP's allegation that why he was awarded the degree in 1979 when he graduated in 1978, Das said "It is difficult to comment on minor errors." On Monday, Bharatiya Janata Party president Amit Shah and Finance Minister Arun Jaitley had released copies of Modi's BA and MA degrees in response to AAP's allegations. The AAP had said the documents were "forged" and had "glaring discrepancies" in them. When asked about discrepancies in calculation of marks and the marksheets being "typed ones" while other degrees issued by the university during that period had handwritten details, Das said, "it is not possible to comment on every variation. I can only confirm that the degree is genuine". An AAP delegation led by Ashutosh visited the university to check records of Modi's graduation degree. The authorities asked the AAP leaders to come tomorrow as they did not have prior appointment. "We have two degrees of different individuals one from 1978 and another from 1980. 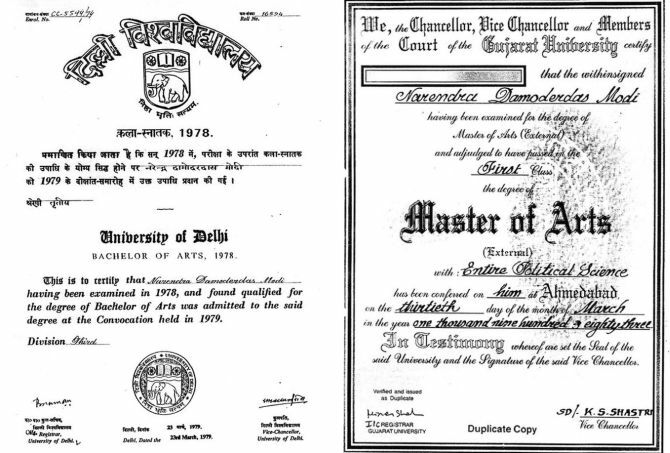 While in the other degrees all the details including the name, course name and marks are hand-written, it is only Modi's degree that has been typed. "The ones forging the degree tried to be smart so that the handwriting doesn't get caught in forensic tests but they forgot to use the proper format as well," Ashutosh told reporters. Another AAP leader Sanjay Singh wondered why the DU had not heeded to the CIC order of making the degree public. "Amit shah and Arun Jaitley had yesterday made public and said the same can be verified from the university. We came to DU but there is an atmosphere of fear and we were not allowed to meet anyone. "If his degree so authentic then why is DU not making it public despite CIC orders. Why records are not being allowed to be inspected? We have to keep some facts before you and our doubts are coming true that the degree has been forged," said Singh.